Ah, Golden Leaf Half. This tops my racing for the year because it was one of those races where my time didn't matter, I simply enjoyed it. A race that reminds me what it is exactly that I love about running. The trails, the scenery, that feeling of being alive. Simply Stunning. All of it. It's a PERFECT time to be in Aspen. Seriously - if you have a chance to run this race, Do. Number two on my list of top races of the year would be the Phoenix Marathon. It was, by far, my most well trained, well executed race this year. It's funny that it happened to be so early in the year. My goal this year was to qualify for Boston. Had I known this would still be my PR 10 months later, I definitely would've been slightly more aggressive in this race, but I am still 100% happy with how it went. I had trained my a$$ off, I was confident, I ran a solid race. I can only hope to do that again this next year. 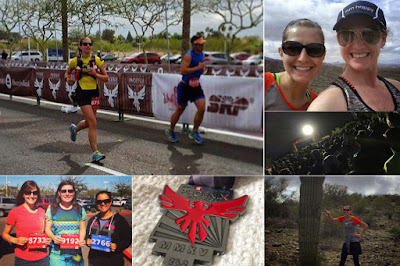 As an added bonus, I also had a lot of fun exploring the Phoenix area with my friend Kellee and meeting up with 2 online running friends, Amanda and Shirley! Slacker was another really well executed race of mine. I am thrilled with my time at this race - although given the fact that it was VERY downhill, I'm never as confident showing it off as my PR (I always have to say, "oh, but it was a downhill course"). However, I still ran this really well - holding my pace in those last few miles was one of the toughest things I've ever done. If there's one thing I've learned this year, it's that I need to work on my mental toughness: pushing through the pain, and just, in general, having more confidence going into a race. Ah Rim Rock. I FINALLY got to run you! Since this was on my home turf, I'd ran bits and pieces, but never the whole thing. And boy was this tough. There are some people who can run this as fast as a flat Marathon. I am NOT one of those people. With over 2000 feet of elevation gain, the first half of this race left me SO incredibly worn out. It was seriously tough. Had the second half not been downhill, I honestly don't know if I could've ran this whole race. Thankfully..THE VIEWS. Stunning. This is why I run! (In addition to the views, I also consider this the "best course" because I just love the feeling of accomplishment after completing a tough course). What a fun race. Seriously. Me...drinking Beer at Mile 9 of a Marathon? Check! Mimosa's at 22 - why not? I loved not having a goal and simply having fun with this one. It forced me to talk to random other runners which was a blast (and I swear, I don't know what it is about running...I am so NOT talkative in real life, but I can find anything and everything to talk about on a run). This really is a great race to just have fun at (plus with all those hills - who wants to go for a PR anyways!? ), especially if you're a Marathon Maniac or Half Fanatic - so many people to talk to and drink with and who knows what else! Oh Revel Rockies. You sweet, terrible, wonderful, cruel race. This was my #1 goal race of the year. Unfortunately the race had other plans for me. So well executed until Mile 17 when my race suddenly came crashing down on me as the stomach issues just kept rolling in. First it was side stitches for several miles, then I just felt completely sick. And finally Mile 22.5. Me. On the side of the road. Vomiting. Running can be SO lovely at times. But hey - we all have bad races. Unfortunately this was one of them, and unfortunately it ended my dreams of Boston 2016. It was tough to accept (it still is actually), but I have faith that my day will come eventually! But hey, the day wasn't a total loss. I got to meet Chris, another online running friend. He ran this as his first marathon in 3:32 and change....want to trade finish times?!. I just wanted to note Mt. Sneffels because I love the race and it was extra special this year since I got to share it with my dad as he ran his first Half Marathon! Loveland Fall Classic was another noteworthy race because after several weeks of extremely rough training (or lack thereof), I was in a bad place mentally until I decided to leave the fate of this race up to God. I trusted him completely and he carried me to my second best executed marathon of the year which I really needed after bombing Revel Rockies. Scott was also able to be at the finish line for this one which was a nice surprise for me, and we went and spent a few days in Estes Park afterword. 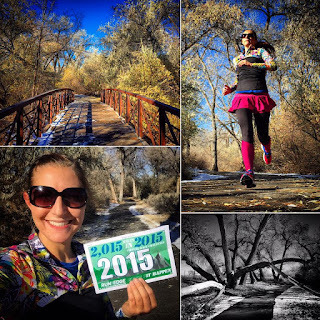 A big goal of mine that I had this year was to complete 2015 Miles in 2015. This counted anything done "on foot", which for me was running, hiking, walking, snowshoeing. 1909 of those alone were just running, so I'm pretty proud of that, especially considering my highest year before was only ever in the 1500-1600 range. I had a blast being a Skirt Sports Ambassador this past year and meeting so many awesome other women! I absolutely LOVE the Skirt Sports ambassador motto: Real Women, Real Bodies, Real Inspiration! 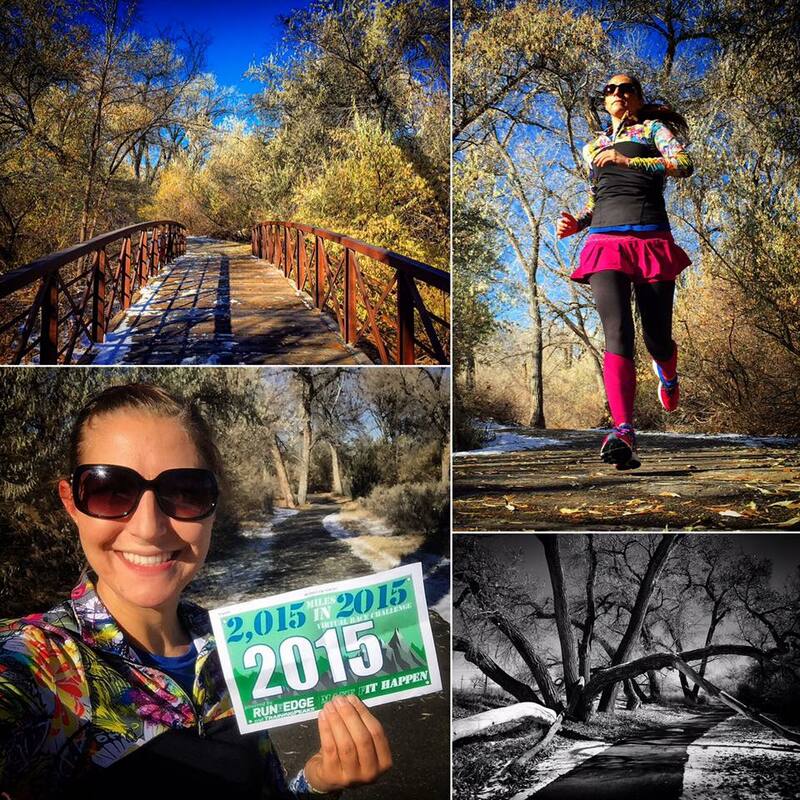 Before I started running, I was so timid and constantly telling myself I couldn't do things like I do now. That I wasn't Athletic enough. Fit enough. Skinny enough. Brave enough. Skirt Sports encourages all women, in all walks of life, to live a healthy and active lifestyle - which is just SO awesome to me! And last, I got to go to Chicago for work, but had a free afternoon where I was able to explore the city on my own two feet, by myself, and honestly, I LOVED it! Wow! So impressed by you! You rocked 2015! I have no doubt that you will get to Boston one day. And don't put down your half PR- doesn't matter what kind of course it is the fact that you ran a half that fast is amazing!